View Faces of the Children Benefit Concert on youtube. Marc Coderre, Julie Larocque, Elaine Mawdsley, and Louise Rathier. 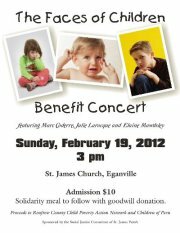 Fundraiser to help Renfrew County’s Child Poverty Action Network (CPAN) and a sister parish in Lima Peru.